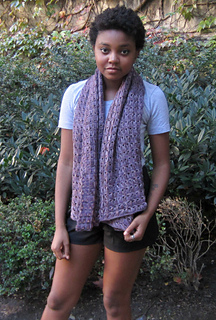 This pattern was originally published in the Fall, 2011 issue of KnitCircus. This pattern is a great introduction to broomstick lace. 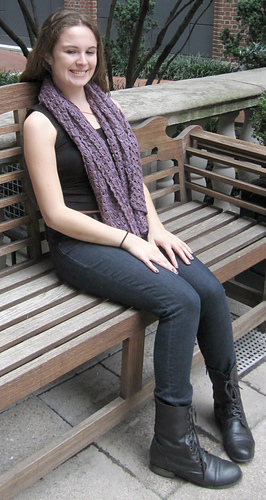 It’s a simple yet stunning shawl with great drape. The revised pattern includes both a written pattern using U.S. terms and a stitch symbol chart (copyright KnitCircus but used with permission). Additionally, there is a photo tutorial, so don’t be afraid if you’re a broomstick lace newbie! 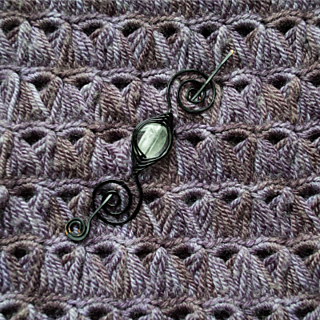 The shawl pin in the second picture is one of my favorites, by Michelle’s Assortment (CraftyFlutterby on Ravelry). 6.5 broomstick lace groups (33 sc) and 9.5 rows (5 rows sc + 4.5 rows broomstick lace loops) = 4 in (10 cm) before blocking. Exact gauge is not critical to this project.